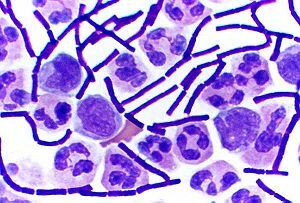 Gram-positive bacteria are bacteria that give a positive result in the Gram stain test. Gram-positive bacteria take up the crystal violet stain used in the test, and then appear to be purple-coloured when seen through a microscope. This is because the thick peptidoglycan layer in the bacterial cell wall retains the stain after it is washed away from the rest of the sample, in the decolorization stage of the test.